So much for a quiet year. 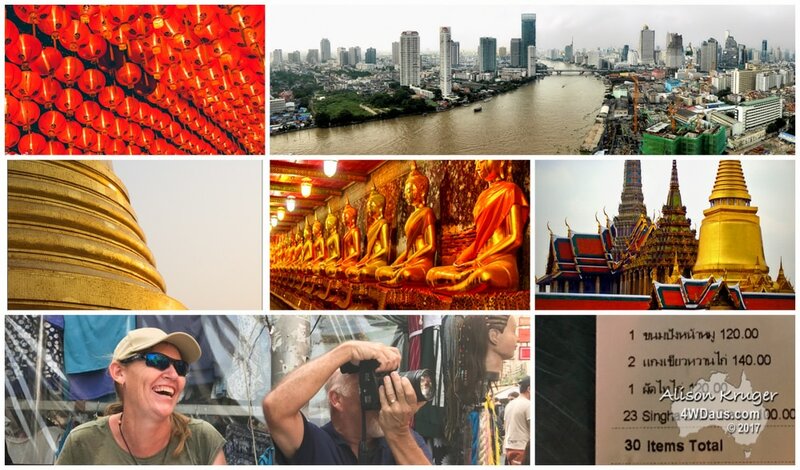 Its only February and we are off on the second trip of the year, to no less than Thailand. This trip was the result of a Thai dinner takeaway late last year where Neil and Steve decided that it would be a great idea. So after a few months of planning the day arrived. 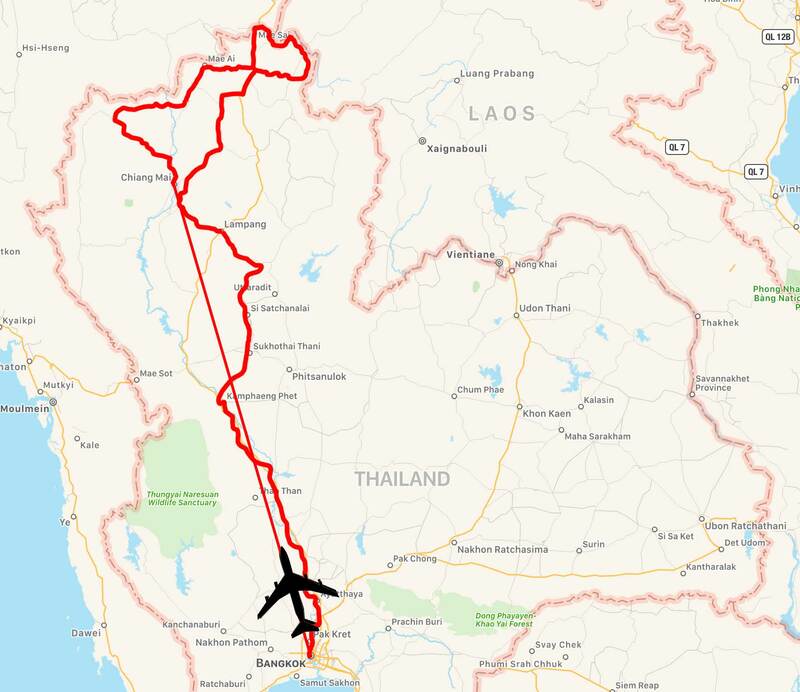 The following map is the route we took, flying from Bangkok to Chiang Mia and then driving in our 4WD back to Bangkok. There were many photos taken and an amazing time had by both Steve and myself, and Neil and Connie. 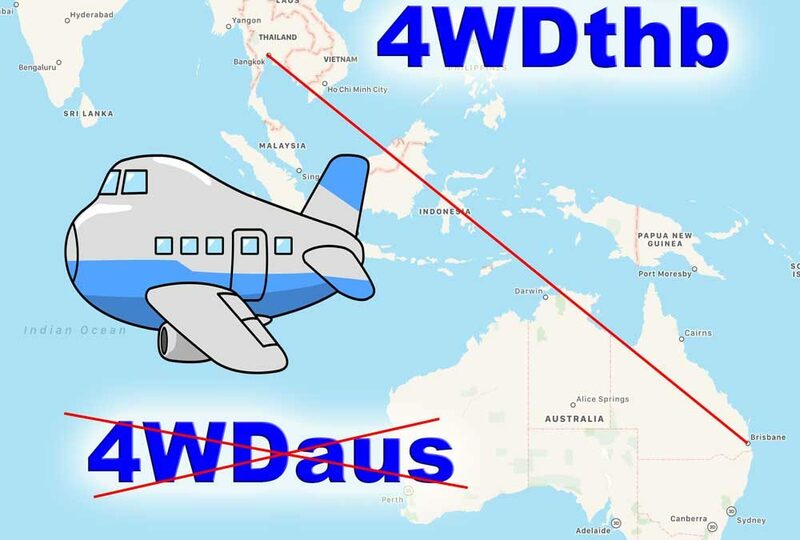 It was a leisurely trip on 2 buses and a train to the Brisbane International Airport. We arrive 3 hours before the flight which flies direct to Bangkok. I was lucky enough to be selected for the full body scan, which meant I was through security quickly. 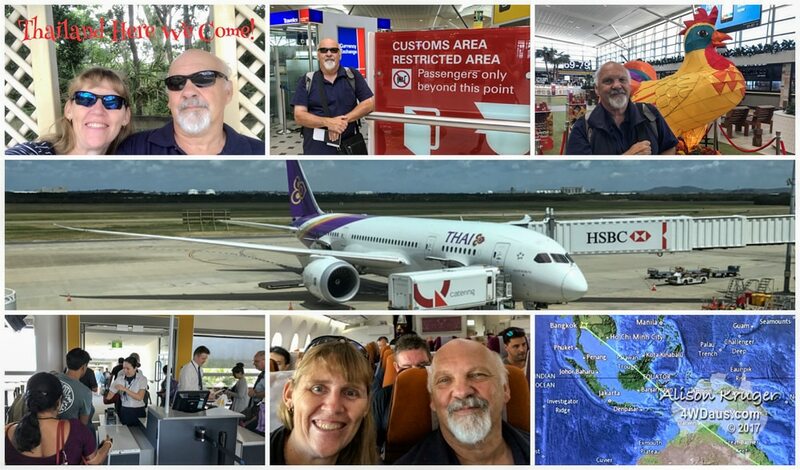 We boarded the flight late due to Thai Airways delay, but thanks to a good tail wind, landed on time in Bangkok. The trip through customs was very slow and we climbed into the taxi about 9pm. The road into the city was very elevated and passed enormous billboards, all lite up brightly. We arrived at the hotel, booked in, and fell asleep about 10:30pm (1:30am Australian Time). After a good night’s sleep it was time to get ready for breakfast with Neil and Connie at the Peninsular Hotel. Talk about totally spoilt for choice and the quality of the breakfast was 5 star. I know we ate too much, but it was just so good. Thank you Neil and Connie for spoiling us! With contented tummies, it was time to explore the sites along the river. 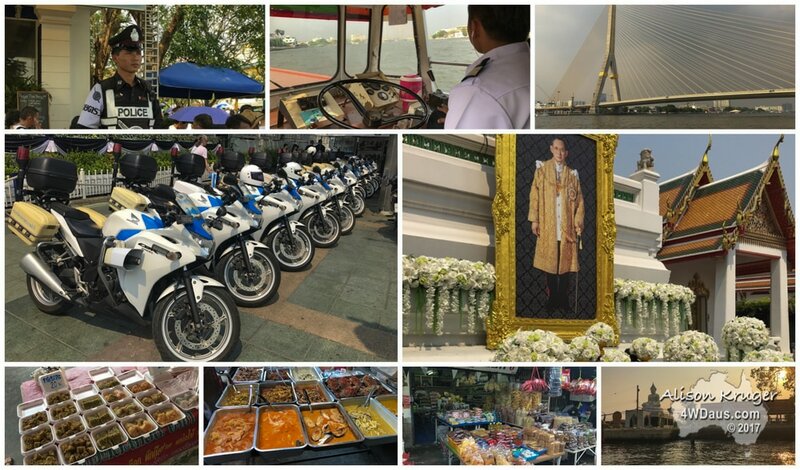 The Chao Phraya River flows through the centre of Bangkok and has a large amount of traffic, both industrial and tourist. We took the ferry which costs us 15 THB or about A$0.70. It was visually interesting seeing the old and the new buildings on the edge of the river as we visited the many wharfs along the river edge. The deckhand would communicate with the driver through a series of whistles, back, forward, steady and go. 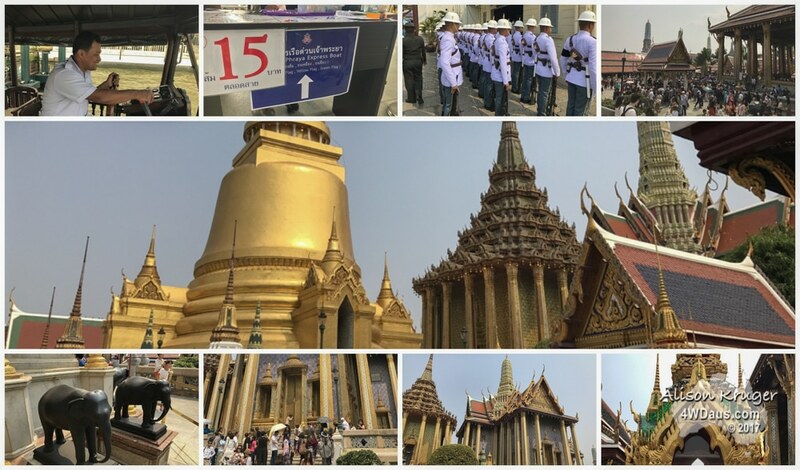 After what seemed about an hour we left got off close to The Grand Palace. The Grand Palace and the Temple of the Emerald Buddha (Wat Phra Knew) were completed in 1784 and has just got to be seen to be comprehended. WOW! Golden light baths the site reflected from what must be tonnes of gold plating and leaf which seems to cover everything. 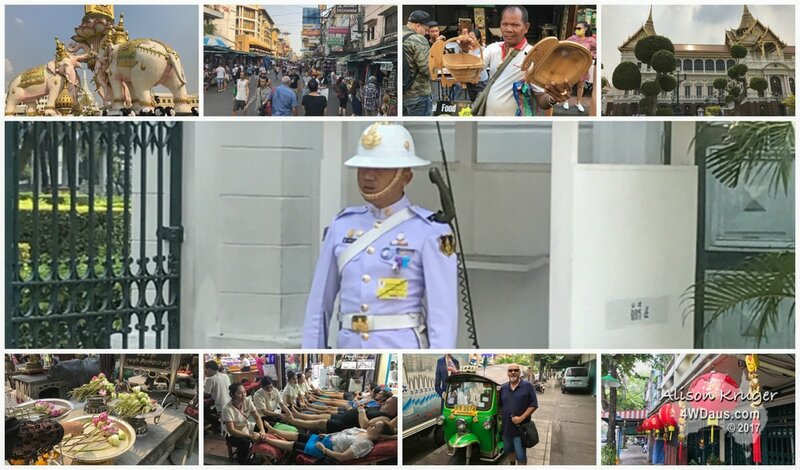 With the passing of Thailand’s King Bhumibol Adulyadej the Grand Palace was certainly busy. A section of the palace had been closed off to the public and an endless line of mourners dressed in black could be seen waiting patiently to pay their last respects to a great leader. The Giant “Reclining Buddha” was spectacular, as was the Palace. A few hours later we were back on the ferry heading for our hotels so we could freshen up for a night of Thai Food and Chang Beer. 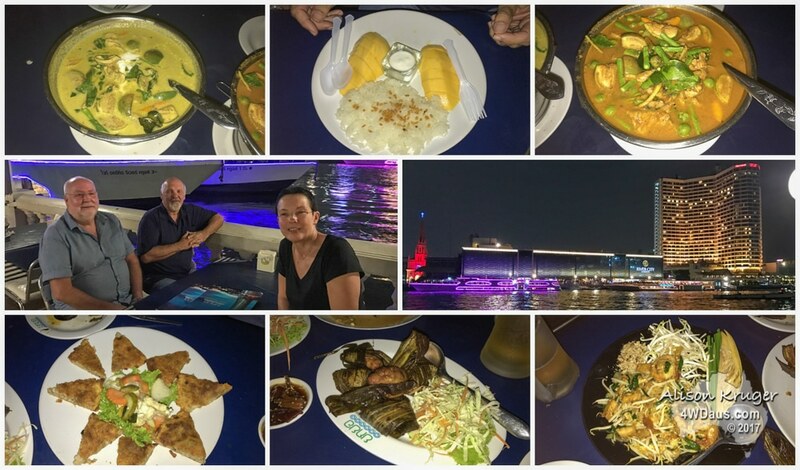 The restaurant was on the edge of the Chao Phraya River and we could see the boats as they made their way. The large tourist dinner boats with their neon decorations made a beautiful site. We enjoying the tastes of the meal until we tried the green and a red curry. These were so hot they made my ears pop. Our cause plenty of beer to help cool us down. Great night was had by one and all. Still on a high from yesterday, Steve and I woke early and headed off to find breakfast on the street. 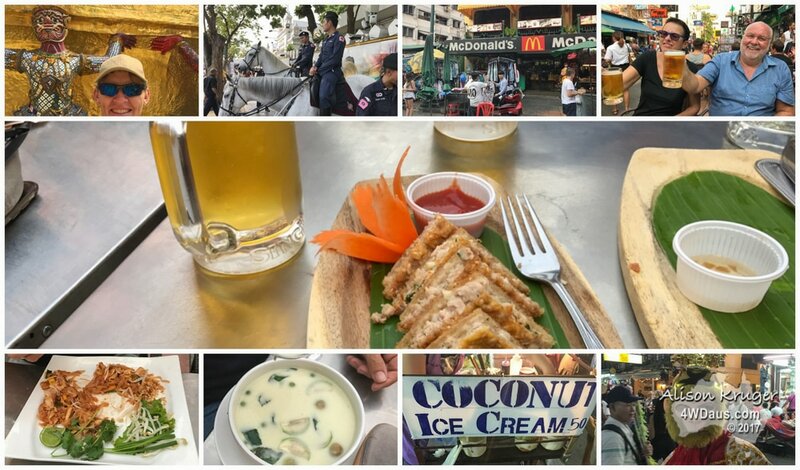 It was cool walking around the streets and eating street food. Steve took a love of fresh fruit from a vendor. He carved designs into the pineapple before presenting them for consumption. 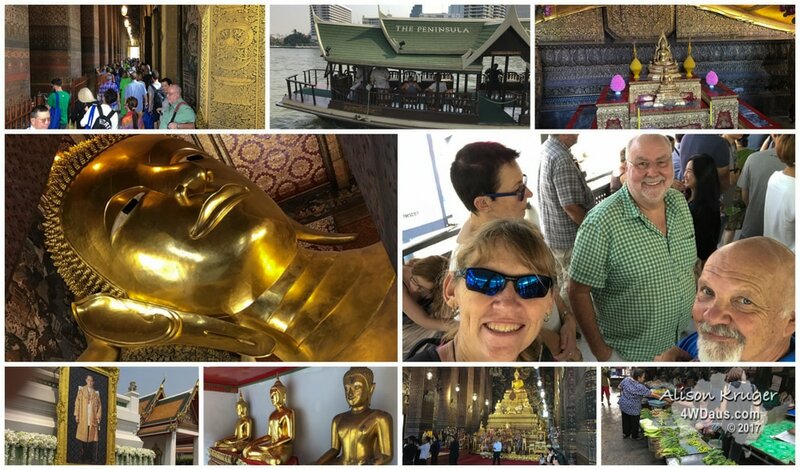 Mid morning we met up with Neil and Connie and headed off on the ferry system to the Temple of The Emerald Buddha. Once again, the streets were busy and the temples spectacular. 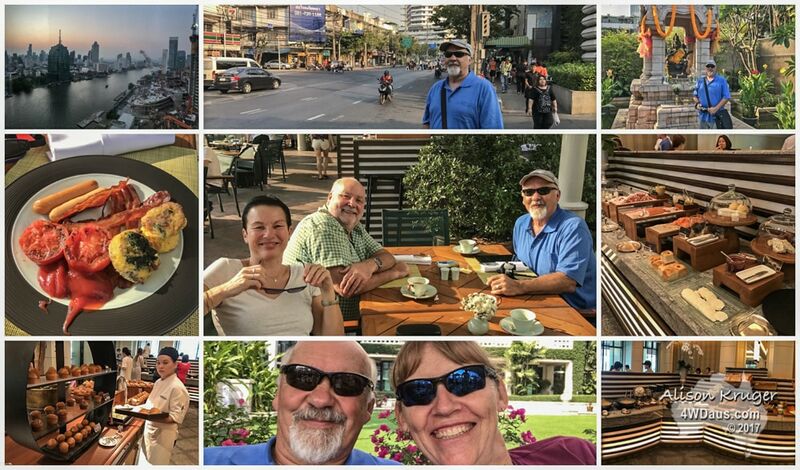 By mid afternoon we headed towards Khao San Road where we settled into an evening of chatting and being harassed by street vendors. They were great fun and tried to see us, wrist bands, hats, cooked scorpions and wooden frogs. Somehow we consumed 23 Chang Beers between the 4 of us. Next fun for the night was catching taxi back to our hotel. Most taxi drivers were unwilling to put their meter on and wanted to charge a flat fee, that was unfair. Eventually, we found a ride and headed for home. Another wacky fun day.